Findlay Foods Info Article: Remember to Blink! Remember to Blink Your Eyes! In today's world, it seems no matter what your occupation, you are required to use a computer as part of your job. Combine that with watching TV, surfing the Net for pleasure, catching up with friends on Facebook, playing the odd game of Solitaire on the computer and we find that many of us spend a lot of time looking at a computer screen. 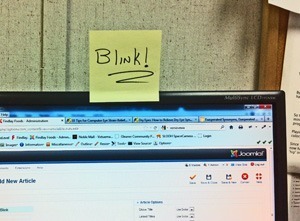 Did you know that on average people blink 5 times less often when looking at a computer screen as other times? It's true. When we don't blink as often, the tears that coat the surface of the eye evaporate causing dry eyes. This effect can be exasperated by the dry air so often found in commercial buildings. The consequences range from subtle but constant irritation to ocular inflammation of the anterior (front) tissues of the eye. All is not lost, for most of us the solution is easy and inexpensive, all you have to is remember to blink more often. How hard is that? To reduce the effects of staring un-blinkingly at the computer screen, try this simple exercise. 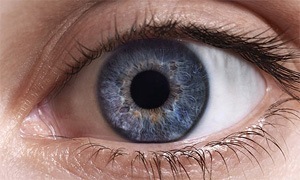 When working at the computer, every 20 minutes take a few moments and slowly blink your eyes 10 times. This simple exercise will go a long way to reduce the drying effect of not blinking enough while staring intently at your computer screen. I know one gentleman who's solution to the problem was to take a post-it note, write "BLINK" on it and attach it to the side of his computer screen.